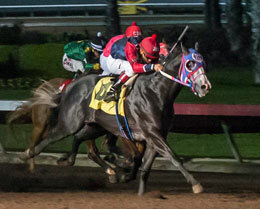 KVN Corona, under jockey Jesus Ayala, winning the Grade 3 $235,200 El Primero Del Ano Derby on March 31 at Los Alamitos Race Course. GUTHRIE, OK—JULY 5, 2018—Lazy E Ranch near Guthrie, Oklahoma announced today they will stand the 2017 AQHA Racing Champion 2-Year-Old Colt KVN Corona next season (2019). An earner of more than $707,000, the son of leading living sire Corona Cartel is currently in training all-time leaving Quarter Horse trainer Paul Jones. 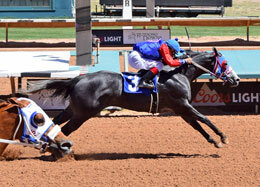 His next start is expected to come in the August 19 Grade 1 All American Derby trials at Ruidoso Downs. 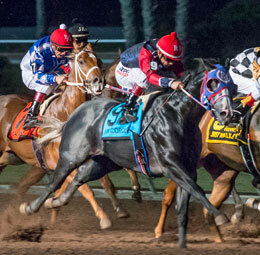 Bred by McColee Land & Livestock, LLC, and owned by Keith Nellesen, Undefeated in six starts at 2, KVN Corona won the Grade 1 $1,000,000 Ed Burke Million Futurity-G1 (over Champion Two-Year-Old J Fire Up) and the Grade 2 $400,000 PCQHRA Breeders Futurity at Los Alamitos Race Course. 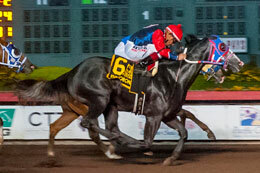 He continued his undefeated streak into 2018 by winning the Grade 3 $235,200 El Primero Del Año Derby at Los Alamitos then qualified for the Grade 1 $759,197 Ruidoso Downs. KVN Corona is out of Grade 1 winner and multiple Grade 1 producer Executive Looks SI-113 ($277,891) by Executive Menace, a son of Chicks Beduino. "We are obviously over the moon with Keith Nellesen's commitment to allow Lazy E Ranch to stand KVN Corona in 2019," Lazy E ranch manager Butch Wise said today. "How can you not be excited about a Champion son of Corona Cartel that went 6-for-6 as a two-year-old?" "You don't need very many fingers to count all the undefeated two-year-old Champions. It is well known that the best runners as two-year-olds most often make the best sires, and he was undefeated at 2 and then ran that string of straight wins to 9. He is already a Graded Stakes winner at 3 in 2018 and a Ruidoso Derby G1 finalist, after coming from sea level in California to compete on the Mountain. It takes a serious racehorse to do that." "Looking at potential sire lines, we all realize Corona Cartel is a Sire of Sires and to underscore that fact he currently has five different sons in the top 25 Leading Sires of Money Earners in 2018. Plus, Corona Cartel is #4 on this year's list as well," Wise said. "But it is not just about his sire, we love KVN Corona's female family as well because Reliance Ranches owns his Super Derby G1 winning older brother Big Lew $640,000, who bred his first book of top mares here in 2018. Knowledgeable breeders will avail themselves of these superior genetics because KVN's pedigree will be attractive to daughters of Mr Jess Perry and his sons Apollitical Jess and One Famous Eagle. Another great positive is that Easy Jet does not appear in either the top or bottom of KVN Corona until his fifth generation. Likewise, one has to go to his third generation to find First Down Dash. All valuable items in today's breeding environment." Wise says. Nellesen, who is a partner in McColee, said, "We take all of our yearlings to public auction to sale, but occasionally I will personally buy one to race. I thought KVN was the best yearling in the sale that year, and I loved his full brother Big Lew. I was very happy and surprised to get him for $140,000." "I'm not an expert on horses, but when I picture in my mind what a horse should look like, I picture KVN," Nellesen added. 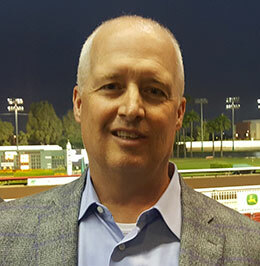 "We are going to breed KVN to the same McColee broodmare band that has produced 18 stakes qualifiers, nine graded, five individual stakes winners and three graded stakes winners in the first six months of this year." Paul Jones, who has had as many Champions as any trainer over the last two decades and is fresh from winning his fourth lifetime (and second consecutive) Ed Burke Million Futurity-G1, said, "For me, KVN is the perfect horse, the complete package. "He is as smart as any horse that I have ever trained. A true professional. Not too big, not too little. Very talented, and easy to train. Very well balanced. As I said, the complete package." The 2019 breeding fee on KVN Corona will be announced this fall.